Finally, a comedy this year that is actually funny. It is rare to find a good comedy these days. So many writers write screenplays thinking that something sounds funny on page, when it is actually completely unoriginal and not even worthy to generate a giggle on screen. “Date Night” is completely different. It is funny in a pure way without throwing in crude or over the top jokes. So many comedy films dwell on gutter humour and it just gets old. But not this one. In my opinion, Tina Fey and Steve Carell are two of the best comedy actors around at the moment, both being “Saturday Night Live” graduates. They are both extremely funny and both brilliant in the way they can think quickly on their feet. All you need to do is watch the outtakes during the credits at the end of the film to realise how quick witted and hilarious they both are. I am a big Tina Fey fan and if there is one woman I want to be like, it is her. However, as much as I would love to meet her, I would feel like a total dunce compared to her. Isn’t it funny with people who were in “Saturday Night Live”, when they are in a movie, there are cameos galore. Keep an eye out on in this film for all the stars who are not listed in the opening credits. When these cameos occur in the film, you will hear all the other audience members exclaim and speak excitedly to their neighbours, as I did. “Saturday Night Live” comedians are known as the most elite comedians in the states and I can understand the star power they have. 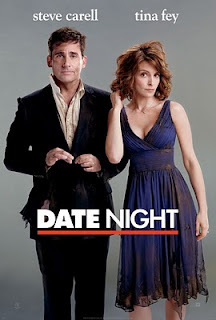 “Date Night” is the funniest movie of 2010 thus far. It is clean, classic humour, but do not think that means it’s dull. The film is far from that. There are still some moments which are just silly, but it’s not possible to have a whole movie where every single joke is funny. A good comedy is one which different types of people can enjoy and one which has you laughing at the beginning and at the end. Nobody likes a comedy that gets old after 40 minutes. Phil (Steve Carell) and Claire Foster (Tina Fey) are a self-confessed boring couple from New Jersey. They feel like their life is getting too predictable and that there’s not enough excitement , so rather than go to their normal diner haunt for their date night, they decide to doll up and go to one of New York City’s best restaurant. When they cannot get a table, they pose as the Tripplehorn’s, who have a reservation, but do not show up when summoned. This turns the night into the most unusual and thrilling date night they have ever and will ever experience. As expected, this is not an emotional journey film, but simply just a lot of fun. The film is not boring or monotonous for a minute. It is predictable in a way as you can easily guess what is going to happen, but you do not know how it is going to happen. There is so many funny one liners that will have people quoting for days after they see the film. It is a very well written and witty script which is well directed by Shawn Levy. The only criticism of the script is that some features of the film are unnecessary, but there isn’t very many of these. The only one that comes to mind is the inclusion of Leighton Meester’s baby-sitter character. The jokes cracked here are very lame and it is clear that the only reason she is there is because she is from “Gossip Girl”. There are also some moments which don’t add up in the grand scheme of things either. Yet, these moments thankfully do not make up the film. The majority of it is just creatively fun and laugh out loud funny. As for the acting, not Oscar-worthy, but both Steve Carell and Tina Fey are hilarious. “Date Night” is a must see for fans of either of these two. The two have great on screen chemistry and work so well together. They just seem to compliment and work off each other. It is definitely Steve Carell’s funniest big screen role since “Anchorman: The Legend of Ron Burgundy”. Fans of “30 Rock” will love the comedy in the film and will see Liz Lemon in many of Fey’s scenes. Taraji P. Henson is great as the tough Detective Arroyo and Kristen Wigg is hilarious as the Foster’s friend, Haley Sullivan. There is also cameo’s galore throughout the film which only add to the fun. “Date Night” is a film which people of all ages will enjoy. More an adult comedy than one for the teenagers, but no doubt they will enjoy it too. The film will make married couples realise how just one night out of the ordinary can make the world of difference. A great comedy film that will be one of the comedies 2010 is remembered for.